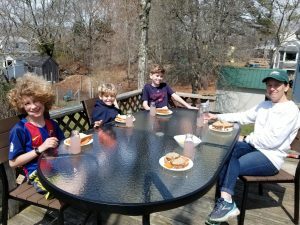 Today was Good Friday, Passover, and the April full moon. How do these things connect? I’m not sure I am clear on all of the connections, but I do know that Jesus celebrated a Passover meal with his followers the day before his crucifixion. Christians observe Good Friday as the day of Jesus Christ’s crucifixion and death. Jews observe Passover commemorating the liberation of the Jewish people from slavery in Egypt. These two things are not connected, but the dates of observance are often close together. Easter happens sometime between March 21 and April 25, determined by the full moon. Passover is celebrated on the first Full Moon following the spring equinox. Today is the full moon, so today was Passover and Good Friday and Sunday is Easter. 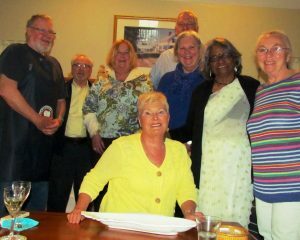 I celebrated the day my pitching in on spring house cleaning at the Goldstone’s, going to be with good friends in my dining-in group pre-dinner, and then heading back to Heather and Jed’s for a Passover Seder. 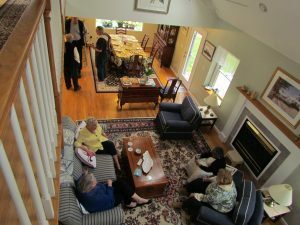 The dining-in group was meeting at Bruce and Jane Woodin’s home. They have a vaulted ceiling open to the second floor and I went upstairs to get a photo of the group below. 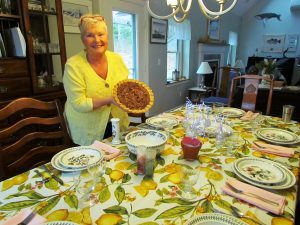 Jane had the dining table beautifully set in an Easter theme and I got a photo of her displaying Midge’s pecan pie. 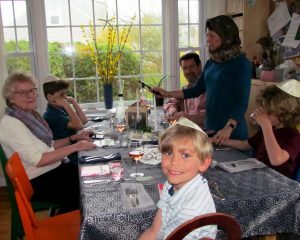 I so enjoyed getting to see everyone before moving on the Heather and Jed’s for the Seder. 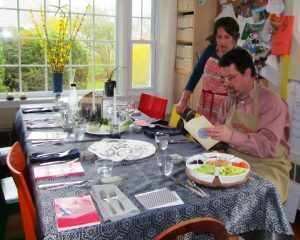 When I arrived the boys were playing a game in the living room and Heather and Jed were doing the final preparations for the Seder. But shortly, Heather lit the candles beginning the Seder. This year, all three boys were able to take an active part. Unfortunately, Sam has what seems to be the flu. He spent the entire day in bed, but he was able to come downstairs and participate. Today included activities that were a wonderful melding of cultures and traditions from Easter to Passover. And I got to sent the entire day with good friends and family. My early morning PT appointment ended up to be not so early. I arrived at 8:30 am as I have for the past few weeks to find out that today’s appointment was at 10:30 am. If I had checked my calendar, I would have known that. But I was on automatic. I spent the time between doing a little garden shopping for Heather. Waquoit Feed and Seed is on my to and from PT, so I picked up a couple of dozen asparagus rootings and checked out another nursery on the way to see if they had strawberry plants. Too early for those, but they will be arriving in the next couple of weeks. After my PT session, I headed to Heather’s and found everyone outside working in the mist. Grammy Marti was fully dressed for the weather and was busy pruning bushes. Jed was pruning the big bushes with the electric trimmer and Heather was assembling the fir st of the raised beds. The boys were raking up the trimmings and Ollie was delivering that to the compost pile using his little tractor and wagon. I pitched in by digging up some irises from one area to another and then removing the sod to form a new herb garden. As I delivered the irises to the new area, Marti took over and replanted them. 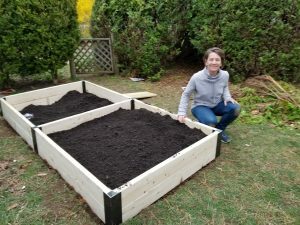 Heather got the first raised bed assembled and Jed worked with her to bring wheel barrows of dirt from the driveway to dump in the new bed. Jonah and Sam left with a neighbor to go to a special activity and Ollie took advantage of their absence to play in the new dirt Jed had delivered to the boys’ digging area. He dug holes and laid in the dirt, poured dirt over his head . . . the joy of dirt. 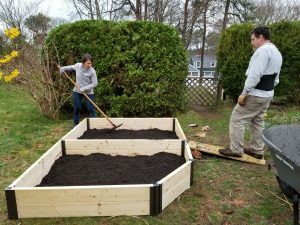 While he was doing that, Heather put together another raised bed and Jed started filling that with dirt. Nine yards of garden soil had been delivered a few days ago and that huge pile in the driveway was the source of all this joyful dirt. Teamwork was the name of the game today and despite the uncooperative weather, lots of yard work was completed. I escaped during all of this and headed downtown to get a dump permit for Heather and Jed’s van and to do some shopping for the Easter Bunny. I was pleased that I was able to do some digging using my new knee, but I didn’t want to overdo it. So, volunteering for the trip into town was the perfect activity for me. Tomorrow’s plan is to do some basement clean-out and take the unwanted things to the dump—thus the reason for the trip into town to get the permit. When I returned from my downtown trip, it was seriously raining. 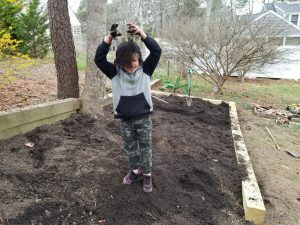 But Marti was still pruning, Ollie was still rejoicing in the digging area, and Heather and Jed were will working to fill the second raised bed with dirt. They were all soaking wet. I said my farewells and headed north to Mashpee to complete the shopping. Things we need for tomorrow night’s Seder were not available in Falmouth, but I did find them in Mashpee. Due to a Stop n’ Shop strike, we now have only one grocery store in Falmouth and it does not have all the things we need. So food shopping has become quite a time consuming experience. 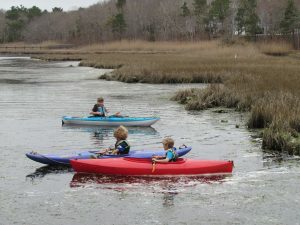 Mashpee has two grocery stores, but one is a Shop ‘n Shop, so the one grocery store in each town is always super crowded . . . especially with the holiday shopping. 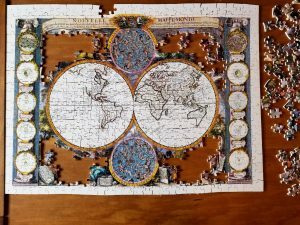 I got home around 6:30, fixed dinner, and settled in to watch the news of the day while completing my coffee table puzzle. Hurray! No more puzzles until winter approaches. but when this puzzle is completed, I am swearing off puzzles until next winter. They are addictive and take way too much of my time in this busy season intended for outdoor activities. When I just wrote ‘coffee table’, I wondered where that term came from. When I Googled it, I found that the first coffee tables, designed as low tables to sit in front of a sofa where beverages can be served, appear to have been made in Britain in the late Victorian era. The idea could have come from the low tables used by the Japanese or in Ottoman Empire. But if the current iteration originated in Britain, why weren’t they called Tea Tables? Mine is used for working puzzles, so I guess it is puzzle table with no beverages allowed! Tomorrow after an early morning physical therapy session, I will be outside, come rain or shine. Hopefully the rain will hold off until late afternoon as there is a full day of gardening and yard work planned at the Goldstones.